The Rocks have been hit by two high-profile player departures - long-serving defender James Crane is to leave Nyewood Lane and Sami El-Abd is reportedly on his way too. The full-back has announced he will not sign a new contract for next season after a decade at the club. The popular player was at the club as long ago as their last spell at Conference South level and became part of the fixtures and fittings at Nyewood Lane over the intervening years. Also moving on is centre-half Sami El-Abd, whose departure will perhaps come as less of a surprise to fans but who is still nonetheless another big-name loss. His partner has recently had a baby and it is believed he no longer wants to make the regular trips to Bognor from his home on the other side of Sussex. Good news is that five players have agreed to sign for next season - defenders Calvin Davies, Keaton Wood and Chad Field, utility man Harvey Whyte and midfielder Tommy Scutt. Manager Jack Pearce said those five were the only ones the club had made offers to at this stage. Crane said on Twitter: "I would like to thank all of the @rocks1883 fans for their support for the last 10 years. I have loved it here. I have made so many friends and good memories but unfortunately I will be moving on next season. Thanks for everything, I will miss you all. All the best, Craney." Rocks fans will fear other members of last season's squad will also move on. 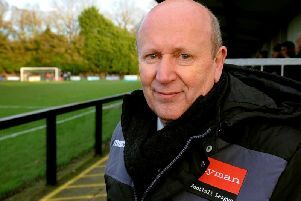 It comes amid continuing pressure for Jack Pearce to stand aside as team manager and appoint a new boss for the Bostik League premier-division campaign ahead. Pearce said there was no news on that front - for now his priority was seeing which players would be in the squad for 2018-19. Rocks supporters' club chairman Ian Guppy said on the club's messageboard: "Took a call from James to confirm with me that he will not be signing for next season. James thanked everybody involved in the club for the past 10 years and highlights the relationship with the fans as one of his highlights of his whole Bognor Regis Town FC career. "He thanked everyone for their support with his operation and the funding for this and was sorry he could not repay that in a Rocks shirt next season. Craney was and is one of life's good guys and I'm saddened he is leaving. I wish him all the best in wherever his career takes him and cannot believe we wont see him in a Rocks shirt next season. All the best Craney!!!!" Guppy said players other than those who were already confirmed as staying or leaving were being spoken to by the management, and there would be more news in due course.